Dynamite Threads: Molly is here! She's absolutely perfect, too! 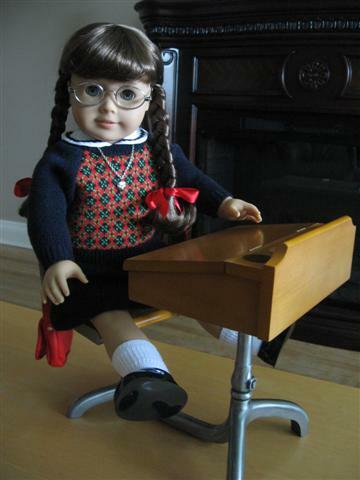 For my birthday I got Molly with her accessories and her school desk. I couldn't be happier with everything. Her school supplies are on backorder but they'll arrive some time in October. The desk is a lovely piece, it's all metal and wood. The seat swivels and the desk top opens up to store her school supplies inside. I have put her glasses case in there for now. The boys got a kick out of the little hole for the ink well just like their big desk has. Molly's glasses are truly a marvel of engineering. They stay on her face but they don't rub her nose or her cheeks. They are very sturdy and nice looking. I wasn't planning on getting any more dolls but with whispers of archival I'm really glad to have Molly. I was content to let Samantha and Kirsten go, but I would be sad if Molly is next and I didn't have her or her desk. Thank you Craig, for such a lovely birthday gift! Congratulations! She's really cute. I love her desk; I had the same kind in elementary school.